Continuing the Pivotal Moments in American History series edited by David Hackett Fischer, The Scratch of a Pen argues that the French and Indian War was one of the most important events in American history. 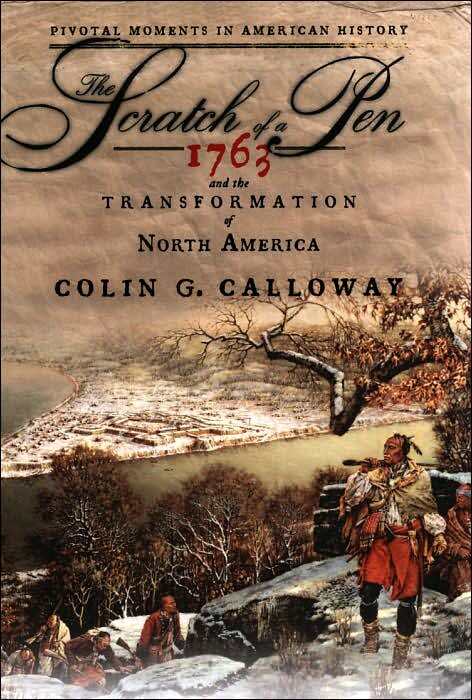 Now most Americans, woefully ignorant of their own national history, imagine that the French and Indian War was, as the name deceitfully implies, a minor skirmish between the French and the Indians. In fact, it was part of a world war where eighteenth century superpowers France and Great Britain faced off for supremacy. "British and French, Americans and Canadians, American Indians, Prussians, Austrians, Russians, Spaniards, and East Indians moguls fought the war, and conflicts had been waged one land and sea, in North America, the Caribbean Islands, West Africa, India, and continental Europe." The result was British victory with the Peace of Paris of 1763. Colin G. Calloway, of Dartmouth College, convincingly argues that everything changed after that. France loses its North American empire with Canada and all land east of the Mississippi River going to the British while everything west of the mighty river was ceded to the Spanish. Most affected by the Paris Peace deliberations were those who were not even represented at the table—American Indians, Acadians, and the American colonists. For the Natives who had maintained good relations with the French, it was the beginning of the end. Much of the land that France ceded on both sides of the Mississippi and north of the Great Lakes was in fact Indian territory. This would lead to two history changing independence movements, that by the Indians in Pontiac's Rebellion and the other by the American colonists. Though Pontiac's Rebellion would fail, in 1783 another Peace of Paris would transform the map once again, establishing a new nation, the United States of America. The Scratch of a Pen is an important contribution on a subject too few Americans understand. Calloway also deserves credit for his analysis of the effects of the French and Indian War on the Indians themselves. Though history cannot be changed, it is imperative that we understand it.